Costs – Learn more about the average cost of tree services in New Haven, Connecticut, including tree removal, maintenance and stump removal. FAQs – New Haven tree laws, thriving tree culture and current pests–how much are you aware of as a current tree owner in this city? See all of this information and more below. Services – If your trees need care today and you’re unsure about who to call, we’ve got you covered. Below is a list of professionals in the New Haven area to call. How Much Do Tree Services Cost in New Haven? Residents of New Haven, Connecticut, take pride in their city’s urban forest. Local trees provide significant benefits, from reduced air pollution to storm water runoff control. However, trees must be maintained and, in some cases, removed altogether. Here are the average costs that New Haven homeowners can expect to pay for local maintenance and removal services. Trees sometimes become diseased or prohibitively unsafe, driving owners to seek their removal. Even well-maintained trees will eventually die. At this point, tree owners in New Haven should call a qualified arborist for an estimate. In general, the more difficult the removal, the higher the pricing. In New Haven, the average cost of tree removal is about $730. The largest and toughest trees in the area, however, could cost up to $1,500. Tree removal also necessitates the removal of the remaining tree stump. This could be an add-on cost paired with the removal, but it may not be. The more dangerous or difficult the job, the higher the labor and, sometimes, equipment cost. The price of a medium stump removal in New Haven ranges from about $80 on the low end to nearly $145 on the high end. The purpose of maintenance is to help trees live a long life. Regular maintenance is especially critical for trees lining public streets. Nationally, the average cost of tree maintenance runs between $390 and $580. Small maintenance chores like trimming applied to small trees could cost as little as $100, but large tree owners with major pruning projects can expect to pay as much as $1,000 on average. New Haven is known for its historical commitment to urban planning, and trees have long played a vital role in this tradition. Home to the first public tree planting program in the nation, New Haven has always been dominated by elm trees, earning it the moniker “The Elm City” as early as the 18th century, and the city is still home to numerous large specimens shading its boulevards. The tallest trees in New Haven are more than 100 feet tall. These include a Dutch elm and a dawn redwood, which are 102 and 101 feet, respectively. Runners-up include a Kentucky coffeetree, a sweetgum tree and a bur oak. In addition, the area is home to tall “Connecticut Champion” trees, including the trident maple, the red horsechestnut and the sweetbay magnolia. Like many other cities in New England, New Haven is also populated by grand specimens of the state tree, the white oak. New Haven passed its first tree ordinance at the end of the 18th century. Today, there is a well-established infrastructure for sustaining the city’s urban forest. Year-round tree maintenance crews overseen by the City Arborist and the New Haven Department of Parks, Recreation and Trees enforce local laws relevant to street trees. Although such street trees are often on private property, Connecticut law holds that the City has primary jurisdiction over any part of a tree that extends onto public domain, such as the street or sidewalk. However, private owners may still bear responsibility for the associated maintenance costs. Ongoing new tree initiatives are usually managed by Yale’s Urban Resources Initiative, or URI. Property owners in New Haven who are interested in replacing or planting new trees along a public right-of-way should contact the Parks Department or the URI. 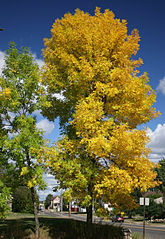 Note that the City maintains a list of recommended street trees known to be resilient downtown; the list includes species like the urban-hardy bur oak and the disease-resistant lacebark elm. The city also specifies which trees are appropriate for planting underneath utility wires. It’s important to plant shorter varieties to avoid interference with electrical transmissions. Acceptable species include crabapples and dogwoods as well as hornbeams and hedge maples. 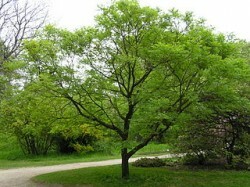 Honeylocust trees, which can handle major pruning, are also suitable under high power lines. The port city of New Haven is located in the Connecticut Valley alongside Long Island Sound in south-central Connecticut. The city has features of both a humid continental and humid subtropical climate. Warm summers bring the most humidity, and cold winters see moderate precipitation, including 6 inches of snow a year. 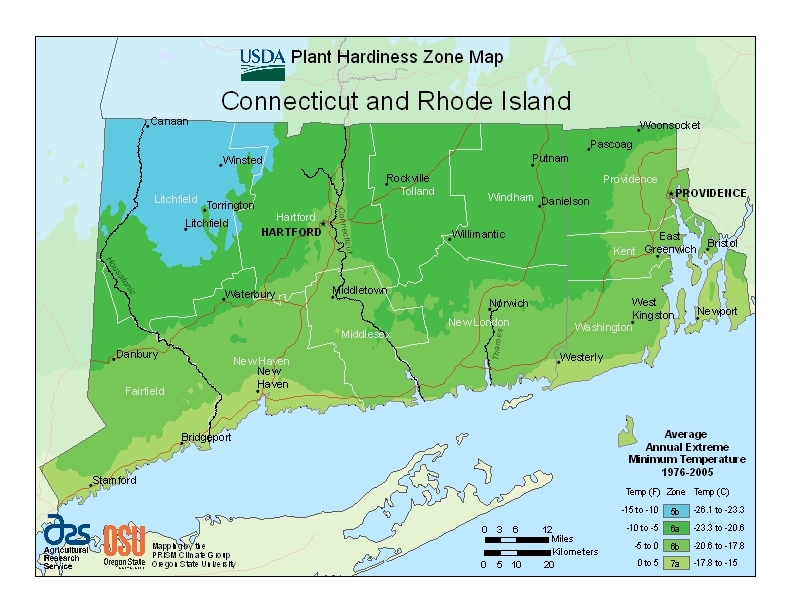 New Haven’s coastal proximity provides milder winters than New England’s interior. A wide range of fruit trees hardy against the winter have been planted in New Haven in recent years, including apple, pear, peach, plum and apricot trees. New hybrid tree fruit has also emerged, such as pluots, a genetic blend of plums and apricots. Sour cherry trees will also thrive here. The city is currently struggling to control the spread of the emerald ash borer, which first appeared in Connecticut in New Haven County. Ash borers propagate disease in and ultimately kill local trees. A quarantine on ash wood remains in place for New Haven. Additionally, some of the most common pests of concern to tree growers are armored scales, soft scales and mealybugs. Many of these bugs affect maple and oak trees.